In simplest terms, manual testing is the process in which a tester physically checks any new or improved product or software for defects and discrepancies. The tester, in this case, is a person who acts as an end-user to check and validate all the features. These checks are usually carried out on a test platform so that bug fixes can be done before the actual launch. Manual testing is the first stage of testing that is done prior to launching or updating an existing product. It is also known as the primary testing stage as it sets course for the feasibility of automated testing. Why is Manual Testing Required? Automation is a brainchild of human development. As such, it too suffers from certain restrictions that the human brain could not have thought of. Suffice to say it is impossible to do a 100% automatic testing. In order to make up for this deficit, manual testing is a more reliable tool. Depending on the size of business a company might undertake automated testing once it successfully completes manual testing. You can also check the manual testing checklist here. Manual Testing By Developer – This is normally the starting point of manual testing wherein the developer himself or any of his peers checks the internal working and the structure of the product or software. Any defects or discrepancies detected at this stage will involve revisiting the product or code in order to take corrective action. Manual Testing by Tester – This is the second step, where a tester puts on the cap of an end user so as to see how the product works as a complete entity. In this step, the complete functionality of the product is examined closely so that the end user experience can be judged. Manual testing is considered to be the least expensive and relatively less time-consuming way of authenticating the specifications and other requirements of the product or software before customer sign off can be gained. This is because automated testing involves the development of a test program which is an expensive task and time-consuming activity. Not only that but developing a test program is also subject to errors that need to be tested and corrected before it can be used. In the absence of a comprehensive test plan, manual testing can give unreliable results due to human error at the testing stage. Overlooking even a small iota of information can give erratic outcomes. At such times, preference is given to a combination of manual and automated testing. The point to remember is that no matter whatever course of action you decide to undertake, manual testing is and should be an integral part of your test plan. This is because automated testing follows a set plan and the results are expected within set variables, but manual testing gives that touch of the human element wherein the behaviour of end-user guides the decisions. To eliminate manual testing is to one's own peril. After all, the reputation of your company and the success of your product depend on it. 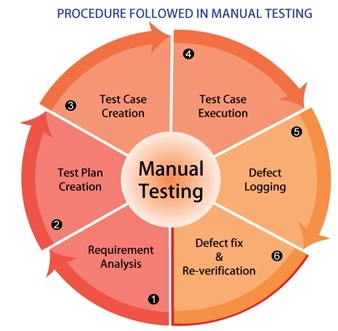 What makes manual testing different from automation testing is mentioned in our next article. Click the link Automation vs. Manual Testing to know the differences. Professional QA in your inbox. © 2019 ProfessionalQA.com - All rights reserved.